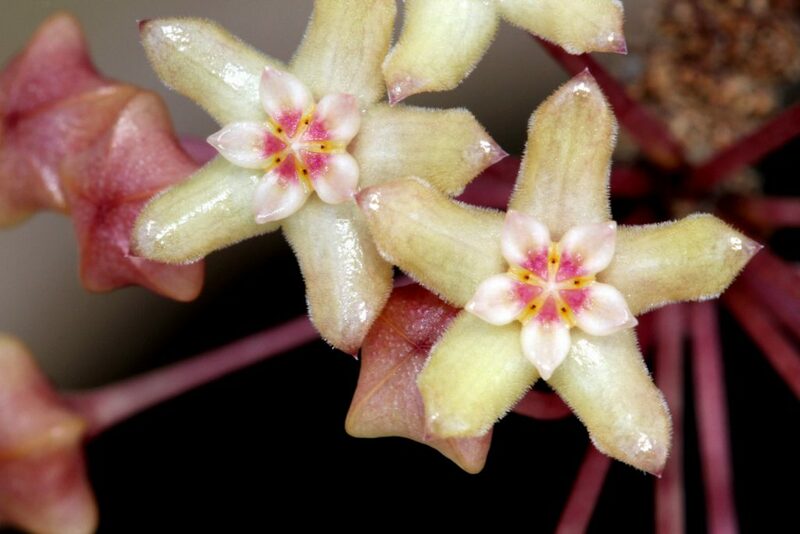 Hoya quinquenervia was first collected in O. Warburg Malunu, Isabela Province in Luzon, Philippines and was described in 1904. The young leaves often have reddish/purple hues and the larger leaves take on a strong reddish tone in strong light. I have not been growing Hoya quinquenervia for very long, but all indications are that it is an easy grower and prolific bloomer. It has grown more peduncles than leaves since I have owned it. The flowers seem to last about four or five days but close up and hang on for some time before dropping. It flowered from cutting at one year of age; the flowers are about 5/16″ across and have a mildly sweet scent. I really like the form and flower structure of this plant and think that it is one that I will be keeping around for a long time.